Continue on to see the first game feature reveal, reveal trailer, and official press release. Xtreme Dirt Tour - In addition to the 3 NASCAR National Series (NASCAR Camping World Truck Series, NASCAR XFINITY Series, and Monster Energy NASCAR Cup Series), players can sling some mud in this all-new dirt racing circuit. Esports Tournaments - Compete against others from across the globe in daily and weekly tournaments. Lay down a great race time and qualify for the Finals in your skill bracket. Win your bracket for ultimate bragging rights! 8 New Tracks - Experience 8 all-new dirt tracks, including dirt racing at Bristol Motor Speedway and NASCAR Heat’s first-ever dirt road course. The final Charlotte Motor Speedway ROVAL layout and the overhauled ISM Raceway have also been added. Deeper Career Mode – Make a name for yourself in the all-new Xtreme Dirt Tour and advance to NASCAR’s 3 National Series. Sign contracts with some of the biggest racing teams in NASCAR or start your own team! See if you can bring home the Monster Energy NASCAR Cup Series Trophy. Stories – Before the green flag waves, get live updates on your race. Watch as a driver gets sent to the back for a technical violation and get updates on who’s having a good weekend, and who’s struggling. Gameplay Improvements – A new racing line gives real-time feedback on the optimal line and speeds in Practice. Skip tuning in the garage and dial in your car’s handling to your unique driving style with 9 predefined car setups. We’re excited to announce NASCAR Heat 3 will be available in North America on Sept. 7, 2018, on the PlayStation 4, Xbox One and Windows PC via Steam! NASCAR Heat 3 is the sequel to 2017’s NASCAR Heat 2, with Monster Games returning as developer. NASCAR Heat 3 has a variety of new features, including a deeper career mode, additional race tracks, expanded online multiplayer features including online tournaments, and a brand-new fantasy dirt-racing experience: the Xtreme Dirt Tour. The Xtreme Dirt Tour in NASCAR Heat 3 allows players to compete across eight new dirt tracks. After finding small town success, players will experience authentic NASCAR racing as they build a career in the NASCAR Camping World Truck Series™, NASCAR Xfinity Series™, and Monster Energy NASCAR Cup Series™ alongside the biggest names in motorsports. Players will also be able to manage their own race teams as team owners in NASCAR Heat 3. 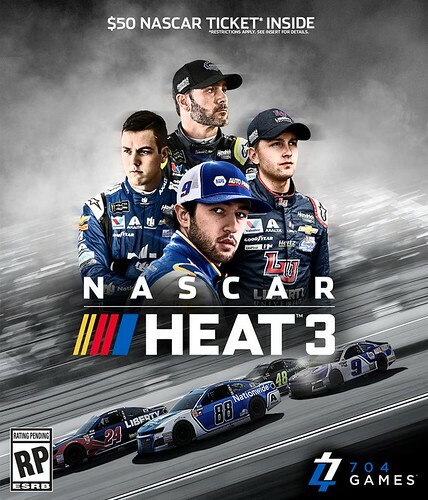 The cover of NASCAR Heat 3 features 12-time Monster Energy NASCAR Cup Series champions Hendrick Motorsports and the team’s star drivers Chase Elliott, William Byron, Jimmie Johnson and Alex Bowman. With the $50 race-ticket coupon inside the game, NASCAR Heat 3 is basically free for NASCAR fans planning to attend a race! NASCAR Heat 3 is available to pre-order today for $49.99 via Amazon, Best Buy and GameStop with digital pre-orders available soon. You can also follow NASCAR Heat 3 on Instagram, Twitter and Facebook for the latest updates. *Offer available while supplies last. Certain restrictions apply. See voucher for details. Picked this game up, always enjoyed a good racing game. It's fun! I'm still in the beginning stages of the career mode, year 2 of the dirt track racing, it's fun sliding the car around the different dirt tracks!